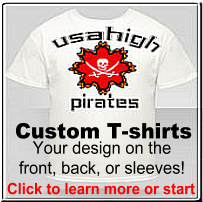 At Creative Advertising USA T-shirts we take custom t-shirts and t-shirt printing very serious. We thought it would be a good idea let you know what goes into each order we of screen printed t-shirts we do. It doesn't matter how you found us on the internet. Some searched by custom t-shirts, printed t-shirts, custom t shirts, screen printing, custom screen printing, t-shirt printing, silk screening, t-shirt screen printing or one of about 500 search terms that could get you to our web site. The best thing is that you are here and found a place that makes the process of printing t-shirt very easy. The next thing we do is decide what type of t-shirt you think you might like for the printing. For example: 100% cotton or 50/50 blend. We even discuss if you are looking for a long sleeve or pocket t-shirts. You can also get custom sweatshirts. We allow you to mix and match. As long as we print the same design you can combo t-shirts and sweatshirts for the best price. Keep in mind the more custom t-shirts you order the better the price. Art work for screen printing is usually the most confusing step for most people. Since you are dealing with CreativeAdvertisingUSA.com you don't have to worry. We provide free art work and free art creation for all orders over 72 pieces. Here is how you can get the art done. You can email an art file, take a picture of something you want us to screen print, send us a sample of an old t shirt, fax us a t-shirt art design, or just explain to us over the phone what you want us to screen print and one of our very talented graphic artists will make your t-shirt art design come to life. You will receive a t-shirt mock up of the art. It will provide you with the color of custom t-shirt you ordered and the art super imposed on it. We place the art anywhere on the t shirt or sweatshirt. You can choose front, back or sleeve printing. In some cases we have printed the inside of the t shirts. We have also printed at the bottom of the t shirt, hoods of a sweatshirt. You are only limited to your imagination. At this time, you can let our art department of any changes you may want to make to your t-shirt art design. We need to make sure we have the printing colors exactly what you want. It can be as simple as black ink on white t shirts or you can call out specific PMS colors. We can even do 4 color process for a t-shirt. In most cases an email proof should be sufficient enough to proceed but if you really need to make sure the custom t-shirts will turn out like you imagine, we can do an actual spec sample. 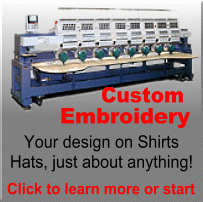 We usually don't take on this expense unless you are printing over 1000 custom t shirts or sweatshirts. We will not print your t shirts until you are completely satisfied with your t-shirt art design and you have approved the art for us to do the t-shirt printing. We want you to be 100% sure you like the design and like the colors and placement of the t-shirt art design. Now that the art work has been approved to print we can output film. This film will be black and will be used to create the screens which will be used for screen printing. We need to make a different film for each color to be printed. The film is then labeled and checked for quality and accuracy. If it meets all 5 quality control measures set by our company we send it to our pre press department which is also responsible for making the screens. Some screen printers have a separate department for screens but we have combined this step at Creative Advertising USA T-shirts t shirts. We have found that if the same people do the film and the screens it reduces some of the questions that come up and the number of times we need to re-burn screens have reached almost zero. This has made it easy for us to pass the savings on to our customers. The screens are coated with a photo sensitive emulsion. The screens are left to dry and then placed on the vacuum light table and exposed to light. The screens are now a copy of the film. We use a pressure washer about 1200 psi to wash them out. This allows the screens to be an opposite of the film. This means that the area where the film was placed on the screens will be the only area that will allow ink to pass. At this point they are double checked again for accuracy. We are finally ready to begin the actual screen printing process. Each color in the artwork design will require it to be blocked, taped, set-up, and ink squeegee onto the t shirt. This process needs to be completed every time you screen print a t-shirt. You can probably surmise we the cost of screen printed t-shirts drops dramatically as the quantity ordered goes up. More is better and more is cheaper. We charge 20.00 per screen. If you only printed 1 t-shirt at a time. The cost of just the set up would be 20.00 but if we did 100 t-shirts the set up would drop to .20 each. Usually on orders of small quantities we use one of our manual screen printing presses and for the larger orders which require multiple flashes we use our automatic 10 color screen printing equipment. The flashing helps give you bright printing quality. This means we dry the ink quickly between each layer of ink. This act like a primer and is essential when printing on dark garments. Now that you understand all the goes into screen printing you may appreciate the finished product just a little bit more. I also hope you know realize why most screen printers have set minimum quantities when ordering. We have a house minimum of 15 pieces. We tell people if you can do less but the cost will be the same if you order 15 custom t-shirts or only 1 custom t shirt. The last and most important thing is to enjoy the screen printing that we have done for you. We stand by our work and have built a reputation of providing quality screen printing at wholesale prices. Please contact us with any questions. We don't have you use one of those awkward design labs. 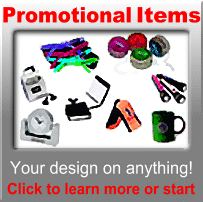 We have live help ready to assist you on any and all screen printing projects.